Grab your favorite microphone, plug it into your iRig Pre HD and record straight to your device with true studio-quality sound anytime and anywhere. Simple as that. As pioneers of the mobile music revolution, we know very well what it takes to produce great content on a portable device. Whether you are a musician, podcaster, journalist, videographer or vlogger, you instinctively know how important it is for your content to be the highest quality possible to be well received and how audio plays a critical role in the process. 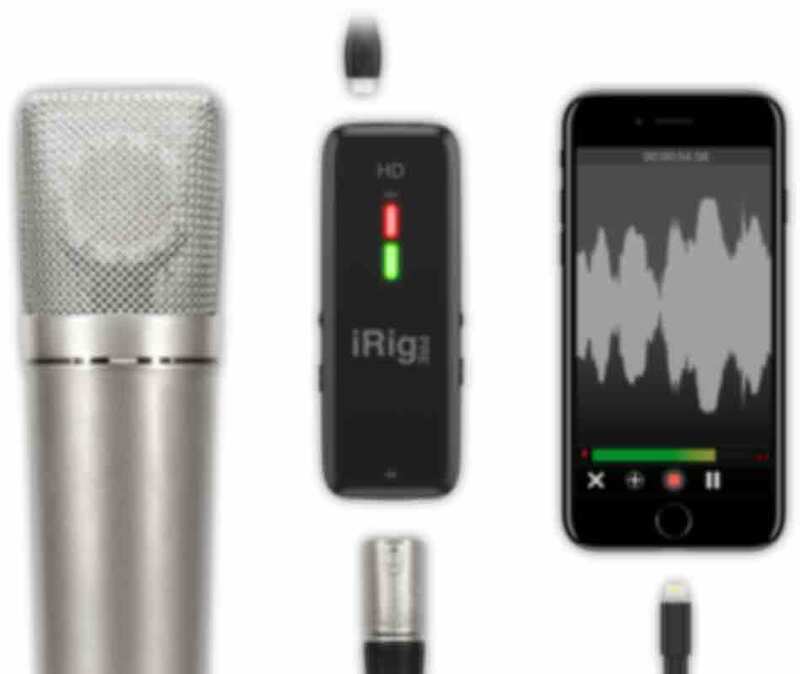 Being a certified Apple MFi interface (“Made for iPhone and iPad,”) iRig Pre HD is guaranteed to work out of the box with all iOS devices using a Lightning connector including those that do not have headphone jack. The included Lighting cable allows for plug-and-play with Apple iOS devices while the USB cable connects Mac and PC computers offering the ability to record anytime and anywhere using your favorite dynamic, ribbon or condenser microphone models with phantom power (using batteries). Delivering exceptional, best-in-category sound quality with up to 96kHz/24-bit resolution and full, flat frequency response from 20Hz to 20kHz (+/- 1.5dB), iRig Pre HD is the bridge between the world of portable devices and the one of professional microphones for recording instruments, sound for media, video, speech, interviews, documentaries and more. Its integrated, high quality Class A preamp ensures that you can easily record the full dynamics of the sound being captured by your microphone down to the finest details and with crystal-clear quality. The elegant multicolor LEDs will help you visually set the right amount of gain needed for your applications and will tell you whether phantom power is in use. iRig Pre HD allows you to record with astounding quality using your favorite XLR microphones on the go. This means you can easily achieve authentic studio sound with your portable device regardless of where you are. As a superb, flexible, high-resolution microphone interface for studio recording, film, radio, television and broadcast applications, iRig Pre HD packs an incredible amount of punch in an ultra-compact enclosure that you can easily carry with you and delivers outstanding results with even the most gain-hungry microphones. Its integrated, high quality Class A preamp ensures that you can easily record the full dynamics of the sound being captured by your microphone down to the finest details and with crystal-clear quality. The elegant multicolor LEDs will help you visually set the right amount of gain needed for your applications and will tell you whether phantom power is in use. iRig Pre HD is a versatile performer in virtually every professional context. If you are a musician or a singer, you can use it with a dynamic microphone to mic up a guitar amp or to record amazing vocal takes with your trusted large condenser mic, (just engage the +48V phantom power and you are set). You can even use it with ribbon microphones to faithfully capture their gently rolled-off character. If you are a journalist or a correspondent, you now have a tool that allows you to capture ready-to-stream hi-res digital audio on your device during interviews, on-the-ground news reports and much more. If you are a video-maker you can take advantage of iRig Pre HD’s ultra-compact portability (without adding significant weight to your bulky video equipment) to capture ready-to-use audio during a location shoot. iRig Pre HD features an onboard headphone output with dedicated volume control that can serve a variety of useful purposes. It can be used as an auxiliary output to send out the recorded sound to external devices like an amplifier, a PA, a compact mixer or a radio system. You can use it to drive your favorite set of headphones and enjoy high-resolution music playback on your device (even the latest iPhone), taking advantage of the high-quality internal D/A converters. The direct monitor switch allows you to listen to the sound being recorded in real time. This means you can easily monitor yourself while recording a vocal take with a backing track or listen to your interview guest in a noisy environment without any latency. With the simple flick of the switch you can change back to regular monitoring and check the playback or listen to other audio files. iRig Pre HD comes with a Lightning cable and USB cable for immediate connection to your iPhone, iPad, Mac or PC, 2 AA batteries and a velcro strip so you can secure it to a mic stand, your belt or other supports while in use. IK software and apps included! With iRig Pre HD you also get Mic Room for Mac/PC and iOS, our creative app that lets you record with the sound of some of the greatest microphones ever manufactured. Easily integrate the unique character of these rare and expensive models in your recordings at the touch of a finger. Plus, Mic Room is Audiobus and Inter-App Audio compatible, so it can easily be used with other applications for countless creative possibilities. iOS users will also enjoy the included versions of the Mic Pack for VocaLive, that adds a collection of virtual microphone models to the real-time vocal effects processing and multitrack recorder app; Pro Bundle for iRig Recorder, which adds essential processing like equalization and compression to the pro-audio recording and editing app with video. 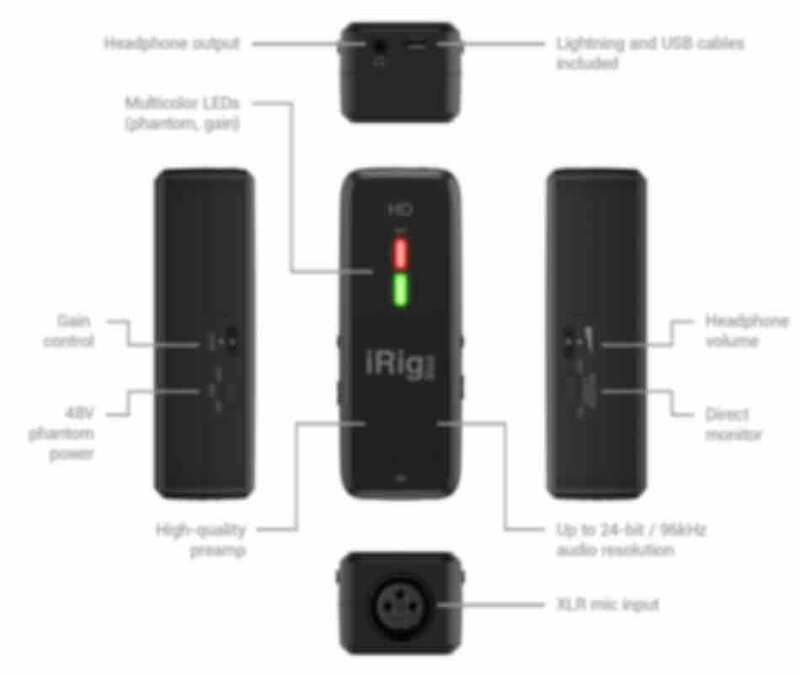 iRig® Pre HD is a registered trademark property of IK Multimedia Production Srl. All other product names and images, trademarks and artists names are the property of their respective owners, which are in no way associated or affiliated with IK Multimedia. Product names are used solely for the purpose of identifying the specific products that were studied during IK Multimedia’s sound model development and for describing certain types of tones produced with IK Multimedia’s digital modeling technology. Use of these names does not imply any cooperation or endorsement. iPhone®, iPod touch®, iPad®, GarageBand®, Mac® and the Mac logo are trademarks of Apple Computer, Inc., registered in the U.S. and other countries. App Store is a service mark of Apple Inc. Android is a trademark of Google Inc.